DETROIT -- The UAW said its executive board voted today to ratify a new labor contract with Chrysler despite divided support for the deal between skilled trades and production workers. A majority of Chrysler's UAW-represented production workers voted to approve the new labor agreement with Detroit's No. 3 automaker, but a majority of skilled trades workers voted to reject the deal. Because a majority of the union's skilled trades members voted against the tentative hourly agreement, the union said today its executive board investigated the reasons skilled members voted against the proposed. The board determined that the reasons for rejection were "predominantly economic and not unique to skilled trades members," the union said in a statement. "Accordingly, the (executive board) declared the agreements ratified under the UAW constitution," the union said. The union said the deal was approved by 54.75 percent of production and skilled trades workers who voted. Among skilled trades workers who voted, the union said 55.59 percent opposed the deal. The union said 68.8 percent of salaried workers who voted also supported the pact. The deal covers wages and benefits for about 23,000 workers at Chrysler, the weakest of Detroit's three automakers. Chrysler, which hasn't generated an annual profit since 2005, expects to post net income of $200 million to $500 million this year. "It's not everything our members deserve, but we did the best we could in these uncertain times and negotiated an agreement that will ensure Chrysler's viability so that we can share in its economic success once it has regained financial stability, UAW Vice President General Holiefield, who oversees the union's bargaining at Chrysler, said in a statement. King held a phone conference today with UAW local leaders to poll them on why they believed skilled trades turned down the contract, said a source familiar with the call. When they told King that it was largely economic provisions in the contract that skilled trades opposed rather than items specific to skilled trades, such as a reduction in skilled job classifications, the UAW declared the Chrysler accord ratified, the source said. Asked how local leaders could know what specifically motivated voters, the source said local leaders discerned their motivations by talking with them before and after the vote. "Just because skilled trades were counted separately doesn't give that minority the right to veto a contract passed by the majority," the source said. King did not discuss at all any options for reopening the Chrysler contract during the hour-long call, the source said. In a briefing with journalists later Wednesday, King said the UAW used leaflets, Facebook postings and the conference calls with local UAW leaders to determine that the skilled trades opposition to the Chrysler contract was predominantly economic. If the union had determined that the issues were specific to skilled trades, it would have gone back to Chrysler to try to negotiate changes, King said. Under the Constitution, skilled trades issues can be separated from the rest of the union, but only if the issues are specific to their work. "Skilled trades can't override production," King said. "It's whatever the majority votes on the overall contract, the overall economics of the contract." He said individuals might challenge today's decision through internal UAW appeals, but that is their right under the UAW constitution. The split vote among workers on a national labor pact with a Detroit automaker is unusual, though it has happened more often with local agreements. King cited a similar situation with a 1973 national agreement at Ford that was ultimately ratified after it was subjected to a national review board. The UAW's new contract with Chrysler calls for the elimination of most skilled trades classifications. They are largely being consolidated into five general categories: electrical, millwright, pipefitter, machine repair and tool and die. Workers in the eliminated skilled trades classifications are being asked to cross-train to learn more duties, according to a summary of the contract. Skilled trades classifications such as carpenter/painter, brickmason, furnace repairer and cutter/ grinder have been eliminated. The UAW's deal with Chrysler is also less generous up-front than new contracts approved at General Motors and Ford Motor Co. But Chrysler workers stand to collect more in bonuses and other payments if certain quality, manufacturing and other performance measures are achieved. Unlike the Ford and GM deals, the Chrysler contract provides no buyouts or financial incentives for skilled trades workers to retire or leave the automaker. As part of the UAW deal, Chrysler pledged to create 2,100 entry-level jobs and invest $4.5 billion in plants for new products and manufacturing capacity. Chrysler said the deal will reward workers for the current and future success of the company, while ensuring the automaker remains competitive. "No one involved in the bargaining process leading to this agreement could forget about our near death experience slightly more than two years ago and the second chance we were given by the American and Canadian taxpayers," Chrysler CEO Sergio Marchionne said in a statement Wednesday. "The faith that was placed in us then has been fully repaid." King previously indicated that if skilled-trades workers didn't ratify their portion of the Chrysler contract, it could be renegotiated. "For items that are specifically related to skilled trades, skilled-trades has to pass those items," King said on Oct. 14. "The overall agreement has to be ratified by the overall number." King told reporters Wednesday he does not anticipate any backlash from skilled trades workers on the factory floor. But he admitted that many workers are unhappy with the contract. "Money was a big, big issue, especially because they saw their sisters and brothers at GM and Ford getting a lot more," King said. The Chrysler deal includes a $3,500 signing bonus, with half of the bonus to be paid when Chrysler meets certain financial targets. At Ford, the signing bonus for UAW workers is $6,000, and at GM, it is $5,000. 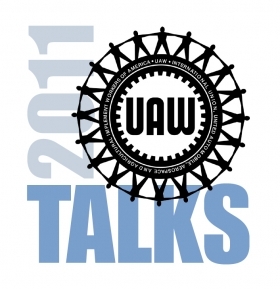 Under Chrysler's 2009 government reorganization, the UAW and Chrysler are subject to binding arbitration to settle any economic differences that arise at the bargaining table. Chrysler workers gave up the right to strike over wages under the terms of its 2009 government restructuring. King said he planned to turn his attention to organizing the transplant operations of the German and Asian carmakers now that the Detroit 3 contracts are finished. He said he still hoped to organize at least one of the plants this year. The contracts, he said during a conference call with reporters today, show that the UAW can work collaboratively with the carmakers to put in place labor provisions to keep the companies competitive while boosting quality and productivity.